The Berning Robot Star is a post-war evolution on the original 1934 Robot. After World War II, the adventure of the Robot went on. Keeping most of the characteristics of the previous models, post-war Robots deals with most of their limitations. 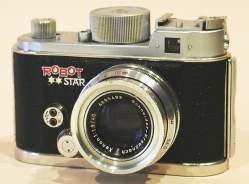 The Robot Star is one of the best versions of this peculiar camera. The shutter and spring motor remain the same. The 90° viewfinder is kept. Standard 135 cartidges take the place of the Robot special cartridges and a rewind lever is added. 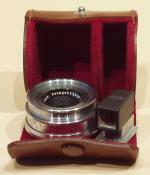 X flash synchronisation appears, available at all speeds, along with an accessory shoe and coated lenses like the 40 mm f/1.9 Schneider-Kreuznach Xenon shown on the picture. The quality of its making and of the available lenses make the Robot Star an interesting alternative to the Leica rangefinders of this era. Other versions joined the family. The cheaper Robot Junior leaves over the angle viewfinder and the rewind lever. The Robot Star 25 and 50 are designed for industrial use while the very expensive Robot Royal (Royal 24 in 24 x 24 mm format and Royal 36 in 24 x 36 mm format) have a coupled rangefinder. The Robot Star is a nice though heavy travel companion. Its settings are quite simple : speed, aperture, distance, that's it. It is very compact, allowing to steal pictures without the subject knowing it. 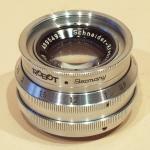 Its noisy but reliable motor and the great number of pictures it can take (60 on a 36 exp. film) make it a good tool for photographic series. The film rewind lever and the ability to use standard 135 cartridges make the Robot Star almost as easy to use as a modern compact. On the other hand, the accessory shoe is so placed that it hurts when winding up the camera. The film rewind lever isn't an ergonomics milestone either (see picture). But its biggest drawback is its lack of a rangefinder, making it hard to use with telephoto lenses without an accessory rangefinder. The sound goes "crick-crick-crick click-bzzz click-bzzz click-bzzz". The crick-crick-crick is the sound of the winding of the spring motor. The three click-bzzz are three shots taken in a row at 1/500 s, the click being the sound of the shutter and the bzzz the motorized film advance. An exhaustive and illustrated list of all Robots on the Robot Empire website. This site is strongly inspired by the Robot Historica book.